Let's start with by exploring the difference between an actively managed fund and a passively managed one (or index fund). In general, a fund is a collection of stocks, bonds, and other investments, which may include cash. An index fund contains the stocks and bonds in a market index, such as the S&P 500 or Russell 2000. The manager of an index fund simply needs to buy stocks (or bonds) to replicate the index. Certain indexes, like the S&P 500, don't change very often. Because the main decisions involve keeping up with occasional index updates, these funds are considered passively managed. Actively managed funds generally involve more work than simply reproducing an index in a mutual fund. Active fund managers must buy and sell securities that match the objective and strategy of the fund. For example, the Fidelity Magellan Fund seeks capital appreciation (growth in share prices of individual stocks) and invests in growth stocks (companies that are growing rapidly), value stocks (companies that are undervalued), or both. The Vanguard Strategic Small-Cap Equity Fund invests in small-cap stocks that the advisor (or fund manager) believes will outperform its index. Generally, I'd want the annual investment returns to exceed the returns of their benchmarks. For example, I'd compare a small-cap fund with the performance of the Russell 2000, which represents small caps, or Fidelity Magellan with the S&P 500 as both contain large-cap stocks. SPIVA (S&P Indices Versus Active) measures the performance of index funds vs. actively managed funds. It's published by the same company that creates and maintains the S&P 500 (that is, it specifies what companies should be contained in this index and updates the index periodically). According to the SPIVA U.S. Year-End 2015 scorecard, “66.11% of large-cap managers, 56.81% of mid-cap managers, and 72.2% of small-cap managers underperformed the S&P 500, the S&P MidCap 400®, and the S&P SmallCap 600®, respectively.” In addition, 75-90% underperformed over 5-year and 10-year periods. I've noticed that even index funds may lag their respective benchmarks because funds have trading and operational costs whereas indexes (aka indices) don't have extra expenses. For example, Vanguard 500 Index Fund Admiral Shares (with an expense ratio of .05%) lags S&P 500 performance by .01-.04% over various timeframes. 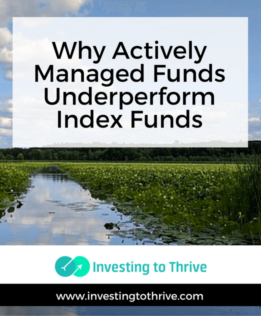 There are at least a few reasons why actively managed funds don't perform as well as or better than index funds. Fees detract from earnings and performance. The cost of operating a mutual fund reduces investment returns. Generally, actively managed funds have higher expenses than passively managed funds or index funds (but be sure to check expense ratios before buying a fund). As an investor, I don't pay these fees directly; instead, they reduce my returns. So, even if the performance of the collection of securities in an actively managed fund outperforms an index, the costs associated with running the fund may reduce its returns to a level below the index's performance. In addition, I look to see whether there are sales, redemption, or early redemption charges whenever I'm thinking about buying or selling certain funds. This information is usually in the fee schedule or my brokerage firm alerts me to the possibility of a charge before I make a trade. These fees won't affect broader measurements of mutual fund performance but they'll reduce my portfolio's performance. The stated objective and strategy doesn't perform well. Some actively managed funds are designed to capture the returns of a certain sector, asset class, or geographic region. When this subset of the market outperforms the general market, funds focused on this sector, class, or region may also outperform. For example, Fidelity has several funds in the health care sector. One is the Fidelity® Select Health Care Portfolio with a strategy of investing in companies involved in health care or medicine. When the health care sector performed well, this fund also performed well. Over the past 10 years, it beat the S&P 500 and the health sector in general. But when the sector delivered poor returns last year, this fund also fared poorly. The main point that actively managed funds collectively underperform indexes still holds. But the rationale that fund managers are bad stock pickers isn't necessarily true; sometimes, they underperform because the sector, class, region, or style that they must follow doesn't perform well. Fund managers may buy popular stock at prices that are too high. Back when I invested more heavily in mutual funds than I do now, I noticed that all of my funds held similar securities — despite having different objectives and strategies. Later I learned that fund managers may buy certain stocks just before the end of a quarter (when they report results and a list of holdings) just to show that they were holding strong performers. There's nothing wrong (or right) about owning a popular stock. But just because a certain well-performing stock is in your mutual fund doesn't mean that the fund manager snapped up shares at a great price. In fact, he may have paid too much for the shares, boosting fashionableness but harming results. There's more money in the fund than there are great opportunities. Generally, fund managers invest money received from investors, rather than hold funds from share purchases in cash. According to an AP article, holding cash (presumably while waiting for a good buy) is rare: only about 36 of 2,000 mutual funds focused on U.S. equities hold more than 25% of fund assets in cash. But the investing opportunities at the time, particularly those that fit the investment objectives and strategies, may not be ideal. Still, fund managers may continue investing in securities, possibly because they feel obligated to invest money on behalf of clients. Note that some mutual funds stop accepting funds from new clients. For example, Vanguard PRIMECAP Core Fund is closed to new investors. What Does This Performance Mean? Statistically, based on the SPIVA report, it's unlikely that an actively managed mutual fund will outperform an index fund with a low fee. As an investor, I'm cautious about paying excess fees or buying funds with high expense ratios. But I was intrigued by a Fidelity report, which indicates that certain actively managed mutual funds tend to outperform benchmarks. Its research indicates that actively managed U.S. small-cap and international large-cap funds delivered excess returns in the years 1992-2014. During this time frame, these funds outperformed their benchmarks. Fidelity's chief investment officer suggests that small-cap and international stocks may not be as efficiently priced as U.S. large-cap stocks; so there may be more opportunities for smart fund managers to outperform their respective markets. It's significant to note that funds sharing both of these characteristics (not just one) delivered outsized returns. Fidelity suggests that having more assets under management (more money!) gives fund managers greater resources to conduct research and deliver above-average results. What I've noticed in my own portfolio is that actively managed funds can outperform index funds for certain periods of time. For example, my husband held Fidelity Magellan in his 401(k) portfolio when Peter Lynch managed the fund and delivered outsized returns. However, average returns for the fund over the last 10 years fell well short of the S&P 500 index. According to this research, if I'd like to buy a mutual fund and forget it, an index fund tied to the S&P 500 or one of the larger actively managed, low-cost U.S. large-cap funds may be a good choice for my portfolio. In addition, I may also benefit holding from an actively managed small-cap or international fund as long as I choose wisely. Do you invest in mutual funds? What is your strategy?